Customizing a product enables value addition. This, in turn, brings in higher margins. Yet, customization comes with its own challenges. Additive manufacturing makes customization efforts much more practical and cost effective. This opens up newer segments. Customers will get better fit with products they buy from you. This makes them happier. Low volume niche products – Yes! Low volume opportunities are not easy to cater to, in traditional manufacturing. Such opportunities involve setup costs and process changes, incurring more fixed costs. Additive manufacturing enables lowering of fixed costs. This helps in going after low volume opportunities which were not profitable until now. Bringing a product to the market before your competitor does is important. It helps you to gain higher market share. It also helps you to get higher prices for your product when there is less competition. In the early stages of adoption, customers are willing to take higher risks. This makes gives them the advantage of using newer products. It also means they will also be less price sensitive. So bringing products to markets faster will get you a higher market share and higher margins. Additive manufacturing helps businesses to bring their products to markets faster. 3D printing enables a business to create just-in-time inventory. This helps to reduce inventory costs. It also reduces uncertainties in inventory management such as lead times and price escalations. 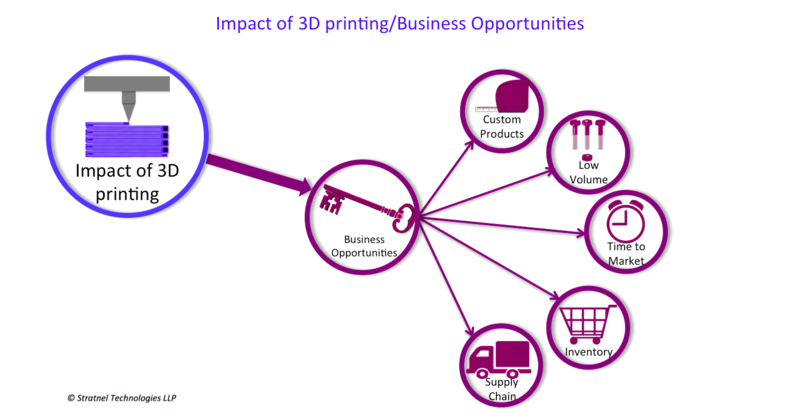 Businesses that need to expand to several countries can take advantage of 3D printing. This gives them manufacturing capabilities even at high-cost centres. A global footprint with a local supply chain is a significant business advantage.